While in general estate planning can be a complicated process with a multitude of factors to be considered and decisions to be made, time and time again I find that it all simply boils down to one common denominator - how property is titled. Understanding who owns what is the one real key to creating a good estate plan, because without the property being titled as expected, even the most sophisticated and well thought-out estate plan will fail miserably. Sole ownership of property simply means that it is owned by one person in his or her individual name and without any transfer on death designation. Examples include bank accounts and investments accounts held in one individual's name without a "payable on death," "transfer on death," or "in trust for" designation, or real estate that is titled in one individual's name in "fee simple absolute," meaning that the individual owns 100% of the property in his or her sole name without the remainder being transferred to someone else after the individual's death. Joint ownership comes in two forms, with rights of survivorship and without rights of survivorship. Joint ownership with rights of survivorship means that two or more individuals own the account or real estate together and after one owner dies, the remaining owner(s) continue to own the property. “Tenancy by the entirety" is a special type of joint ownership with rights of survivorship between married couples that is recognized in some states, while "community property" is another special type of joint ownership between married couples that is recognized in some states. Joint ownership without rights of survivorship means that two or more individuals own a specific percentage of the account or real estate, such as one individual owning 80% and a second individual owning 20%. Joint ownership of property without rights of survivorship is referred to as owning the property as "tenants in common." Title by contract refers to property that has a beneficiary named to receive the property after the owner dies, including bank accounts or investments accounts that have a "payable on death," "transfer on death" or "in trust for" beneficiary designated; life insurance that has a beneficiary designated; retirement accounts, including IRAs, 401(k)s and annuities that have a beneficiary designated; life estates that have a remainderman designated; transfer on death or beneficiary deeds that have a beneficiary designated; and trusts that have a beneficiary designated. Once you understand the three types of property ownership, you will need to understand who will inherit each type of property after the owner dies. In this sense, a property can be viewed in two ways: probate assets vs. nonprobate assets. Probate assets are simply that - assets that will need to go through court-supervised probate after the owner dies. In other words, after the owner dies, the only way to get the asset out of the deceased owner's name and into the name of the deceased owner's beneficiaries is to take the asset through probate. Probate assets include sole ownership property and tenants in common property (or property owned jointly without rights of survivorship). Nonprobate assets are simply that - assets that will not need to go through court-supervised probate after the owner dies. In other words, after the owner dies, other owners or beneficiaries will take over control of the deceased owner's property simply because they survived the deceased owner. Nonprobate assets include property owned jointly with rights of survivorship (including tenancy by the entirety property and certain community property) and any type of asset that has a beneficiary named to inherit the asset after the owner dies. So where do probate assets go after the owner dies? This will depend on whether the owner has, or does not have, a last will and testament. If the owner has a will, then who will inherit the owner's probate assets will be determined by the will. If the owner does not have a will, then who will inherit the owner's nonprobate assets will be determined by the intestacy laws of the state where the owner lived at the time of death as well as the intestacy laws of any other state where the owner owned real estate. Now that you understand the three types of property ownership and the difference between probate and nonprobate assets, you can understand why it is so important for your estate planning attorney to know exactly how all of your property is titled. 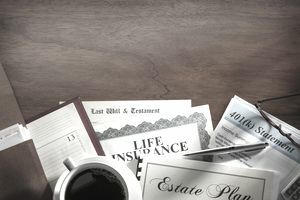 Without this one important piece of information, your estate planning attorney cannot help you create an estate plan that will work the way you expect it to work. Without taking into consideration who owns what, you will be left with an estate plan that will confuse your loved ones and possibly land them in court. So do your estate planning attorney a favor and go through each and every one of your assets and write down who owns it and, if applicable, who is the designated beneficiary, because if you do not do this before meeting with your attorney, then he or she will surely send you home to do it.